Definition at line 1439 of file PatternMatch.h. Definition at line 1444 of file PatternMatch.h. 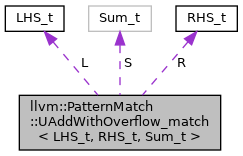 Definition at line 1447 of file PatternMatch.h. References llvm::CmpInst::ICMP_EQ, llvm::CmpInst::ICMP_UGT, llvm::CmpInst::ICMP_ULT, llvm::PatternMatch::m_Add(), llvm::PatternMatch::m_ICmp(), llvm::PatternMatch::m_One(), llvm::PatternMatch::m_Value(), llvm::PatternMatch::m_ZeroInt(), and llvm::PatternMatch::OneUse_match< SubPattern_t >::match(). Definition at line 1440 of file PatternMatch.h. Definition at line 1441 of file PatternMatch.h. Definition at line 1442 of file PatternMatch.h.